Will I need a membership to use the app? If so, what membership is right for me? Yes, you’ll need a membership to use the app. What happens if I’m currently a monthly member? You’ll transition over to the Basic Membership ($14.99/month) with the option to upgrade to the Standard or Premium Memberships. If you want to keep access to the community online forums, you will need to upgrade to one of the higher tiers. What happens if I’m currently an annual member? You’ll transition over to the Standard Membership ($149 annually) with the option to upgrade to the Premium Membership. Will there be any kind of trial membership? Since current VIP annual members will be automatically placed into the Standard plan, what will happen to the ebooks we already have access to, on the dashboard? Do we have to upgrade to premium to get that content again? There will be about 120 recipes available at launch. We’ll constantly be adding 20-50 recipes a month, but at the launch, we will not have all the recipes available. We’ve already loaded many of our member favorite recipes and you’ll find a wide variety of seasonal options, as well! There will also be a feature to request recipes if there’s a particular one you’d like to see added to the app. Will the existing website/dashboard remain intact? Yes, if you currently have a membership, you will still have access to all of your past PDFs on your dashboard. It looks like you will still be able to get the emailed PDFs as an annual member so I'm not sure if the app will be an absolute requirement or not? You will no longer receive a weekly meal plan PDF. You will need the app to do your meal planning and access the recipes. 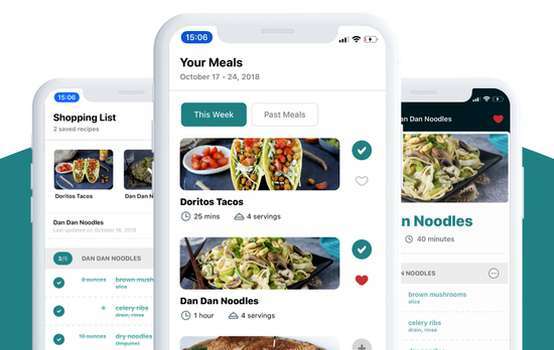 Later versions of the app will give you the option to print individual recipes or customized shopping lists directly from the app, but this feature won’t be available at launch. If Annual members have already paid for blueprints, can we access them in the app with a standard membership? The app is just for meal planning. If you previously purchased the Blueprint, it will still be available for download via your email or from Happy Herbivore. You can always email support@happyherbivore.com if you need help locating your Blueprint purchase. Current Blueprint customers will continue to automatically have access to future Blueprint products. Lindsay will be launching more science-based workshops for the Blueprint coming in 2019! Will the app have an option for slimming options to automatically update the grocery list? Can you mix and match recipes with the app? Can you search “tags” in the app such as Thanksgiving or Detox? You’ll be able to see a list of those different recipes on their own meal plan. The search will be upgraded after launch. Will there be a way to write notes about the recipes in the app? Not at launch, but that’s certainly a feature we’d love to add in the future! As well as the ability to rate recipes and see what recipes your friends in the community are enjoying. 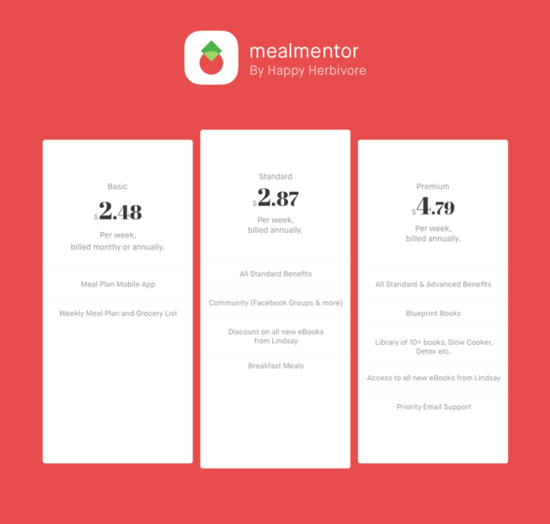 Can you double the quantities of recipes in the app? No, there will not be an option to automatically double the quantities of a recipe. There are certain ingredients you would not want to double and there’s quite a bit of science behind it. We recommend simply making two batches of the recipe if you’re wanting extra servings. This can be a great option when prepping for holiday gatherings! When and where will the app be available and where can we download it? The app is pending approval and scheduled to be available for download on Monday, November 5th. It will be available via the Apple AppStore and the Google Play store! Can we log into the app on multiple devices? Absolutely! It’s a great way for families to all have access to meal planning, especially when splitting up grocery shopping duties! Can I use the app on a tablet? The app is built specifically for smartphones, but can still run on your iPad or Android Tablet device. You’ll just need to change your AppStore to the smartphone version. Will there be a desktop app? No, you’ll need a smartphone or tablet. Is there a software requirement for the app? Your device must be on Apple device running iOS9 or later. Android to-be-determined. Can a print recipes from my desktop? Yes, we will be giving you the ability to print recipes and shopping list from your desktop. We know that many of you enjoy having hard copies! We hope that future versions of the app will give you the option to print individual recipes or customized shopping lists from your smartphone.